Use your mouse to click on and place various weapons and shields. Click on your miner to activate him. Ready, aim, destroy! Bring down the castles of your enemies with well placed and well times cannon shots. Collect gold and leave them bloody and broken beneath the structures that once held them. 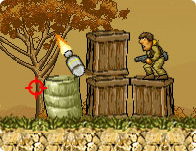 In this real-time strategy game you must lead a small taskforce into enemy territory and destroy their base. Reclaim each region and push the enemy further back each fight.